Contemporary liturgical art is a field of battle, a field of unending collision between the best and worst examples of mural painting, iconography, architecture, music and sculpture. It is a world, where a masterpiece can find itself alongside some gaudy monstrosity, and a clear and honest reflection on an artist�s work will be blurred by an almost heathen, pietistic fear of condemning an �icon�. It is a world where the freedom is given not to the artist (or to tradition), but to the dictates and tastes of the commissioner, whether a church hierarch, or a sponsor. And unlike the great donators of the 12th century � be they Byzantine governors (Nerezi), Russian princes (Nereditsa), Archbishops of Novgorod (Mirozh), Norman Kings (Cefalu, Palermo, Monreale), or Syrian admirals (Martorana) � contemporary commissioners have far greater resources (both in terms of finance and information); yet they clearly demonstrate a far lesser ability to discern and select the best available masters for a given field of work. It is because of this inept quality of the average �decision-maker� that we are forced to silently gaze at titanium �gold� domes, hungrily clinging to any form of roofing; idiotic listen to idiotic instructions to �recreate the 17th century artwork of the Moscow Armory masters, but in the style (!) of Andrei Rublev and Dionysius�; witness death warrants, issued to the bravest examples of contemporary liturgical art, while preference (and finance) is given to sugary imitations of 15th-16th architecture and iconography. The main problem of contemporary liturgical art is the perverted understanding of �the canon� and �canonicity�; instead of retaining the laws of iconography, while providing the artist with the essential freedom to choose and change his style, the artists are forced to limit themselves to the process of stylization, to mere imitations (and often � very poor imitations) of the masterpieces from a bygone era. When will we � as Christians � understand that �to follow the canons� does not mean that we must blindly imitate the past? Imitating the past is in fact the wing-clipping, the nightmare that the great iconographers of the Byzantine world could not even imagine. It is a paradox that the Byzantines, while being very conservative in terms of literature (the best example is the liturgical drama Christ the Passion Bearer, written either (!) in the 4th or 12th centuries), were incredibly innovative when it came to art. Looking at Byzantine art, you can never confuse one quarter of a century with the preceding or the following. And this yearning need for change and shifting of style is clearly evident in other parts of the �Byzantine oikoumene� and the Christian East (in Italy, Georgia, Coptic Egypt, Ethiopia, Syria, the Balkans, in Medieval Russia). One way or another, the problem of our understanding of �the canon� in liturgical art, the ever-present substitution of the guidelines of iconography with blind stylization, is well-known and has been discussed for many years. Yet at the dawn of 2018 something happened� An event that brought the problem of �copying�, �eclecticism� and �imitation� in 21st century Orthodox liturgical art to an entirely new level. After a highly-anticipated competition, the world finally had a chance to witness the presentation of the mosaics, devised by Russian artists for the Serbian Orthodox Cathedral of St. Sava on Belgrade�s Vracar Plateau, the second largest Orthodox Cathedral in the world. Two Patriarchates (Moscow and Serbia), two countries (Russia and Serbia) held a competition, with dozens of partaking artists. The winner was the project, presented by Nikolai Mukhin. This project was met with a wave of enthusiasm. It is praised not only by the church hierarchy and by the sponsors, but even by some art historians. The artwork and composition is dubbed �outstanding�, �original�, �unprecedented�, �the pride of Russia and Serbia�. Upon hearing this praise, we draw nearer to this grand cathedral (which is, in fact, a slightly larger rendition of Constantinople�s Hagia Sophia), marveling at its size and majesty. But raising our eyes to the �sky� of the dome we will only see� a copy. 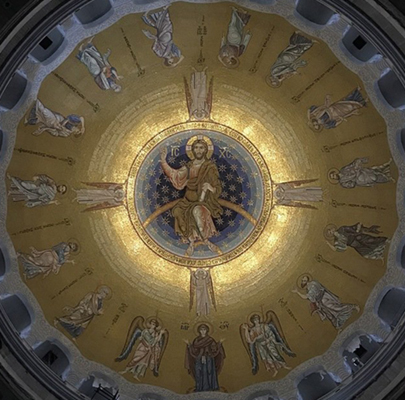 A copy of a very famous, well-preserved and widely popularized work of art: the �Ascension� from the central dome of the Basilica San Marco in Venice. As if our entire reality is merely a computer file, where � by the wave of the commissioner�s hand (and through a prolonged period of work by very qualified artists) someone merely executed the �cut/paste� order. Moreover, the continuing praise of this project raises new � and very painful questions. Since when do we consider a copy to be a great achievement of Orthodox iconography and monumental art? Why this particular sample was chosen to be replicated? Why did the largest Orthodox cathedral in Balkans choose the �honorable� role of a copy exhibit, as if it were an exhibition hall of a college/seminary arts faculty? There is no doubt that certain historic allusions (and even copies) have the right to exist in our places of worship. For example, if St. Sava�s held certain allusions to the frescoes of Sopocani, Studenitsa, the Patriarchate of Pec, Mileshevo (for example � the �White Angel at the Tomb�), this could be seen and justified as an attempt to encompass Serbia�s greatest works of art within the naves and galleries of the new Patriarchal Cathedral. Keeping in mind that the Serbian Cathedral was intentionally built in the likeness of Hagia Sophia, it would even understandable, if the altar apse would be decorated with the copy of Sophia�s Theotokos Nikopeia. But no� In this case, we see a copy taken literally �off the top� of another cathedral�s head, from a church of a different liturgical tradition. The reasoning? Probably because this was the sample that the sponsors and the artist �liked� the best. As if you saw a chandelier in your neighbor�s house, and ordered one exactly like it for your own home. Not the bbest motivation, neither theologically, nor historically, nor artistically. Of course it�s all a matter of context. When and where exactly do we see a copy or a stylization? In the New World, thousands of miles away from the �Orthodox heartland� of the Mediterranean, the Caucasus & Eastern Europe? A grand example would be the New Gracanica Monastery � a replica of the famous Kosovo shrine, built by the Serbian Orthodox faithful in the suburbs of Chicago, Illinois. A brilliant and touching sign of memory and devotion in the heartland of America. Another example: in 2015 in Yasenevo, one of Moscow�s outlying districts Patriarch Kirill consecrated the two-story Church of the Intercession of the Mother of God: the higher church was decorated with copies of 12th century Byzantine mosaics from Sicily (Cefalu, Monreale, Palermo�s Palatine Chapel), and the lower church encompassing the replicas of the Holy Land�s shrines: the Holy Sepulchre, the Stone of Unction, the Bethlehem Cave, etc. This project could be attacked both on theological and aesthetic grounds. First and foremost � for the rather �brave� and unsuccessful attempt at replicating the image of Christ Pantokrator from the Cefalu Cathedral, a masterpiece that could not be repeated even by its authors and other Constantinopolitan mosaicists of the 12th century. But the very idea and motivation behind the construction of this church (as well as the execution of many of its mosaics) deserves our respect. On the outskirts of Moscow, away from the historic center, among the forests and concrete Brezhnev-era buildings, they�ve built a church, which allows the residents to come at least one step closer to the beauty of Jerusalem, Bethlehem, Sicily. For many, it is the closest that they will ever get. Yet the case of St. Sava is different. Here, on the very place where the relics of Saint Sava were burnt by the Turks, the second largest cathedral of the Orthodox world is erected. The Memory of the Witness and Suffering of Orthodox Serbia. A symbol of the Resurrected and Cleansed Hagia Sophia. Its decoration could have (and should have) manifested a new chapter in Eastern Christian liturgical art of the early 21st century. 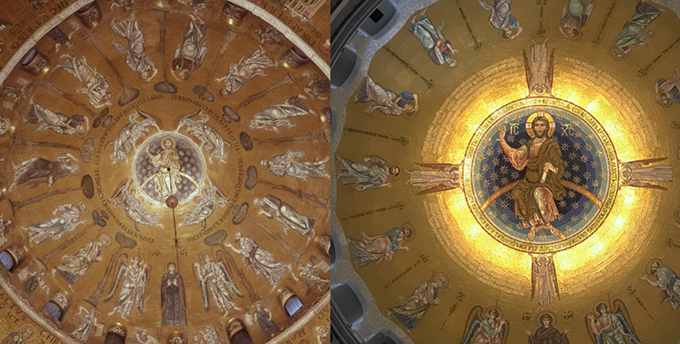 But instead, the largest cathedral dome in the Balkans was decorated with an enlarged and distorted copy. And by the way � it only takes an hour-long flight from the Venetian original to the Belgrade copy. The scale of this �secondary� state-of-mind, this voluntary barrenness, this self-limitation cannot be overstated. In the decoration of St. Sava�s dome there are two �authentic� traits (or deviations) from the original. First, Mukhin made the figure of Christ significantly larger. This literally shattered the delicate balance of the original Venetian composition, adding a slightly �inhumane� and apocalyptic character to the Ascension scene. Of course there are cases, when the figure of Christ would be expanded in the Ascension scene, giving it an eschatological resonance� But not at that level. One way or another, the apostles and Mother of God are all crushed by the dominating figure of our Lord; the crowns of the trees in Belgrade�s copy are far smaller, with the trees turning into feeble barriers (or enclosures), separating the apostles. Thus, both man and nature are crushed by the manifestation of God�s strength and might� Not that such a rendition doesn�t have a right to exist; but it�s noteworthy that this shifting of accents is made by a contemporary artist, and is absent in the 12th century original. The second �innovation� would have severe consequences for a medieval artist, and would be condemned by both � his colleagues, and the ecclesiastic hierarchy of the time. And yes, we are talking about the angels. If in the original, the angels are portrayed floating around the mandorla of our departing Lord, Mukhin decided to turn the angels into pillars (or bars of the cross). These �angel-pillars� only vaguely remind the Early Byzantine mosaics at the Roman church of Santa Prassede; rather, they add an unexpected Ar Deco touch to the �medieval� work of art. And one can rightly argue that such an eclectic and unmotivated collusion of styles is not entirely for the better. The most serious problem here is not even the Ar Deco, architectural shape of the angels, but the way they are standing. One has his foot directly over the head of the Apostle Paul, the other � stands with both feet directly over the head of the Mother of God. An angel trampling over the Theotokos, as if she is Arius, or Satan. Not a single medieval artist would ever dare to render such an unforgivable deviation from the basic principles of iconography, not a single donator would tolerate it. Yet this scandalous iconographic mutation is left utterly unnoticed among the overall praise: a sign of complete blindness of both � the artist and his commissioners. Nevertheless, I would like to point out that this essay is not aimed at total criticism or at blunt condemnation of the entire mosaic ensemble at St. Sava�s. The work on the interior decoration is still underway, and � keeping in mind the scale of the mosaic ensemble and the professionalism of the artists involved � we have every reason to hope that the naves of St. Sava�s will be adorned with inspiring and well-executed works of art. Yet here we�ve decided to speak only of the dome. Not to be �negative�. Not in order to concentrate on �minor� details� Because the dome � of all places � is not a minor detail. Along with the altar apse it is one of the two central �canvases� in the sacred space of the church; a canvas, where the two central images must take their rightful place. Now we have to live with the sad reality that the Dome of St. Sava�s, the second largest Dome of the Eastern Orthodox Church, will never receive its own � unique � �sky�. Robbed of this opportunity, it will be forced to cope with a distorted copy. Two great Patriarchates (Serbia and Russia) unfortunately used the Dome of St. Sava to publicly manifest their preference of distorted copies over the living art and living tradition of the Christian East. A person who loves, knows and cares for the Eastern Orthodox Church, its art and tradition, will undoubtedly be heartbroken not only by the �artistic�, but also by the verbal manifestations which we heard during the decoration of St. Sava�s dome. One cannot help but ask � why so much pathos? Why the inexplicable silence � from the hierarchs, clerics, artists and art historians involved � with regards to the Venetian original? After all, not a single speech, not a single source (article or website) from the parties involved mentions San Marco or the venetian artists of the 12th century. No one mentions the fact that Nikolai Mukhin�s �original� work is a copy of one of the best known 12th century masterpieces? Why the silence? Why praise a copy for �originality�? Why this highly questionable �deviation� from reality, from truth suitable for us as Christians? It is likely that the pathos and the �augmented� reality which we witnessed in all of the speeches and declarations surrounding St. Sava�s mosaics, is driven by the sincere respect to the artists (and, undoubtedly � the sponsors); and the orators decided to overlook the �lesser� truth-seeking for the sake of the �greater good�, the praise of the brotherhood and unity of the two nations and two local Churches. But can unity be achieved through untruth? Can a liturgical work of art be untruthfully called brilliant and original? In other words, can a beautiful lie tower over the altar of God? Why this falsehood? Falsehood in art as well as in words? Sergei P. Brun is a Russian historian, specializing in the history of the Latin East and the Church of Antioch, an author of several articles, papers, translations as well as the two-volume monograph The Byzantines and the Franks in Antioch, Syria and Cilicia (Moscow, 2015).